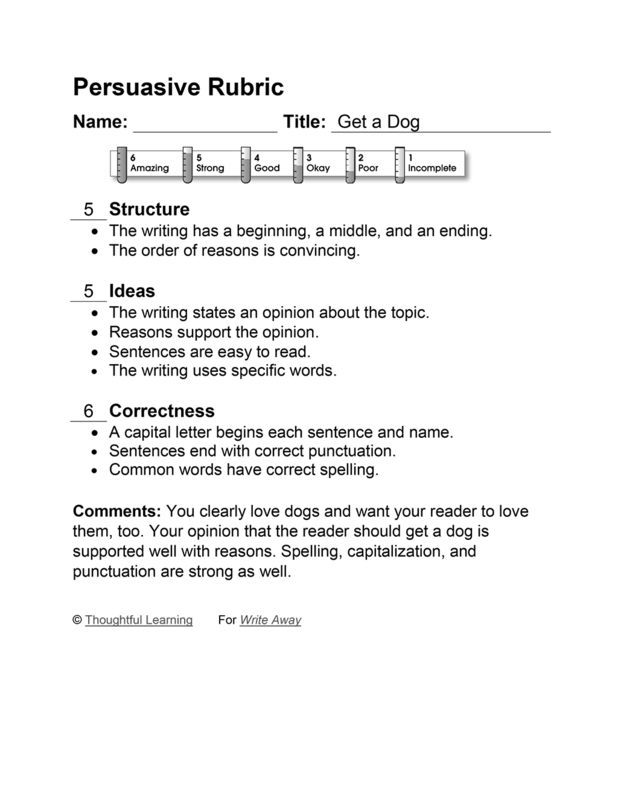 In this second-grade opinion paragraph, a student urges others to adopt a dog and take good care of it. Dogs just love people. People should love dogs too. You can have a big dog or a little one. You just have to love your dog and take good care. If you feed your dog and go for walks and have a real good name like Buster your dog will love you forever. You also should brush your dog and give it a bath. They don't like it, but they will stink. Then they shake the water all over dad which is hilarus. So get a dog. You will be happy and so will your dog. Get a Dog by Thoughtful Learning is licensed under a Creative Commons Attribution-NonCommercial-ShareAlike 4.0 International License. Based on a work at k12.thoughtfullearning.com/assessmentmodels/get-dog.